Let’s me introduce you guys to my first ever cardigan! I called them “Keep me warm cocoon cardigan” . They are made up from one piece of rectangle with2 skein of acrylic yarn that hold double while crochet but if you don’t like to work with 2 strand of yarn while crochet just switch up with chunky yarn and you all set! 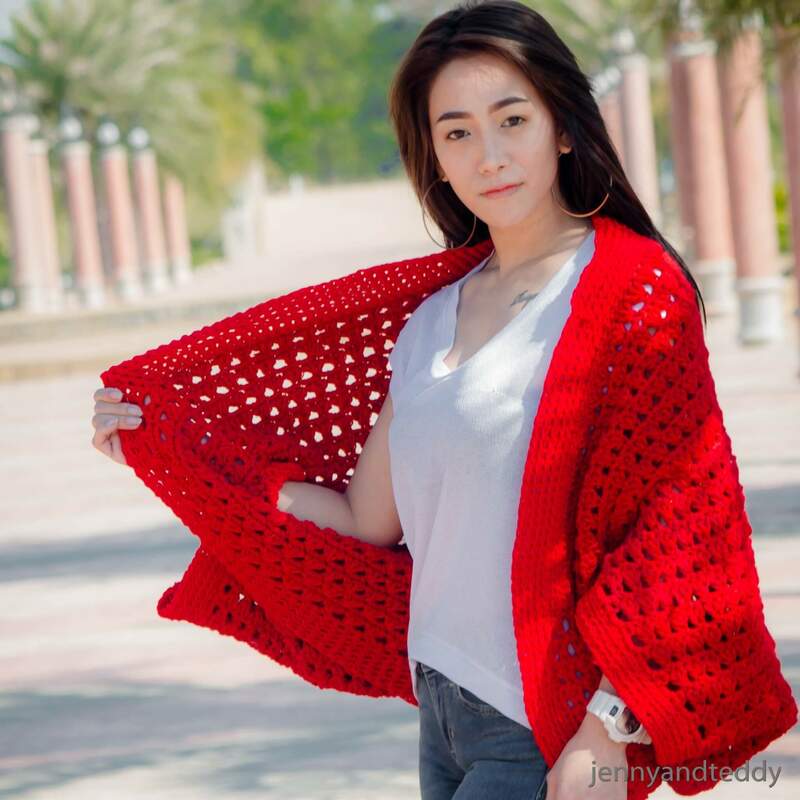 This pretty in red cocoon almost like you turning a blanket into a cozy and stylist cardigan. 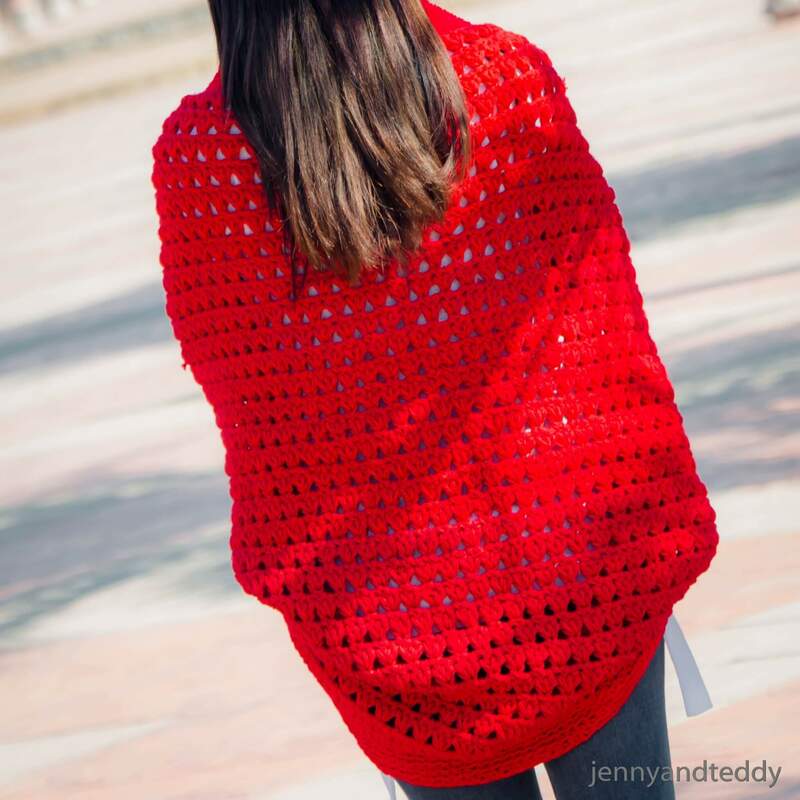 This pretty cocoon cardigan is work up like you guys are crocheting a big piece of rectangle…. 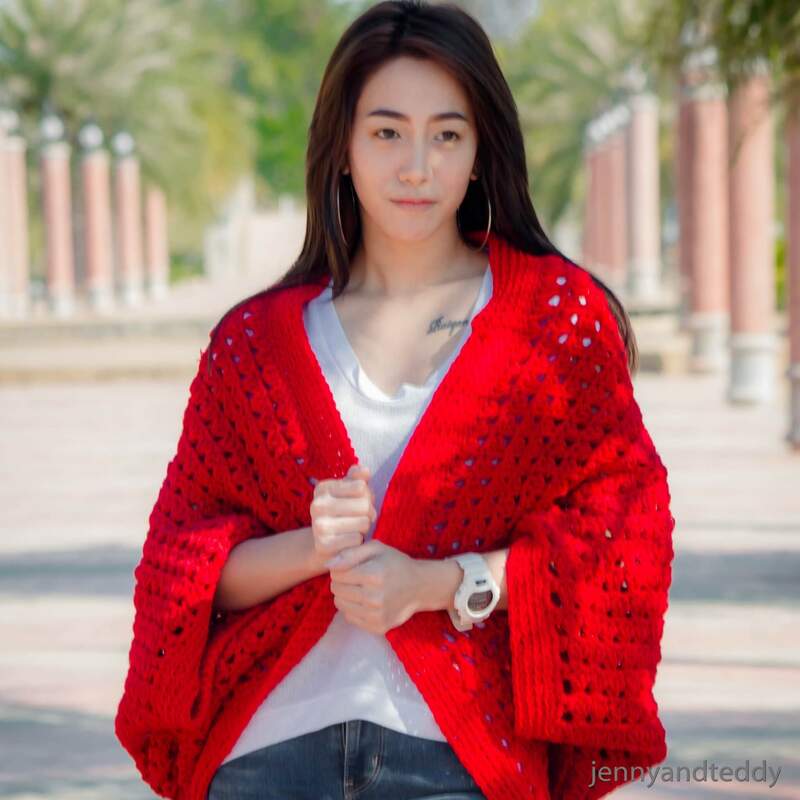 I designed this cardigan to be oversized so it will be fit most of you and with this pretty triangle stitch will create the beautiful lace and keep you warm at the same time. I also make video tutorial for this cardigan as well. 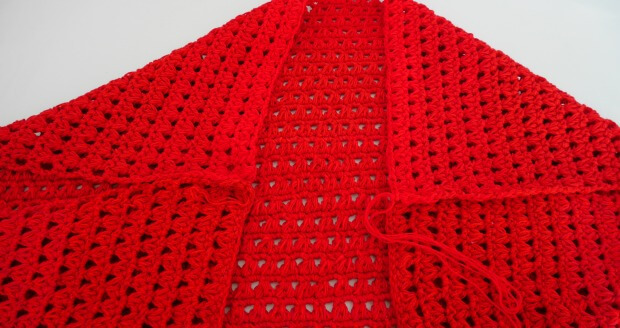 You will be holding 2 strand of yarn while crochet at all time for this pattern. 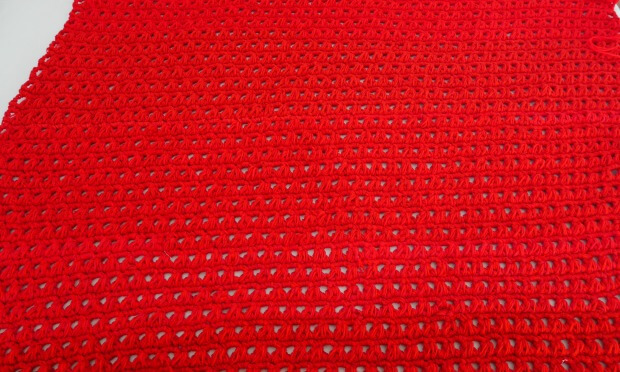 But If you donot like to work with 2 strand of yarn while crochet just swap with chunky yarn instead it will do the job. For chunky yarn or bulky yarn I would recommend Lion brand wool ease thick and quick. Triangle Stitch (TS) – Ch 3, and yarn over, draw the loop through the first st and yarn over and pick up a loop in next 2 stitch, yarn over and draw through 7 loops on your hook ( first triangle made), ch 2, yarn over, draw a loop pull through in same stitch as last stitch of previous triangle and pick up a loop in next 2 stitch, yarn over and draw through 7 loops on your hook ( second triangle made). Keep me warm cocoon cardigan instruction. Start of by making a slip knot Then make 100 chains foundation chain. (you can adjust the size of cocoon cardigan to be small by decrease foundation chain in even number. or Bigger size by increase foundation chain. 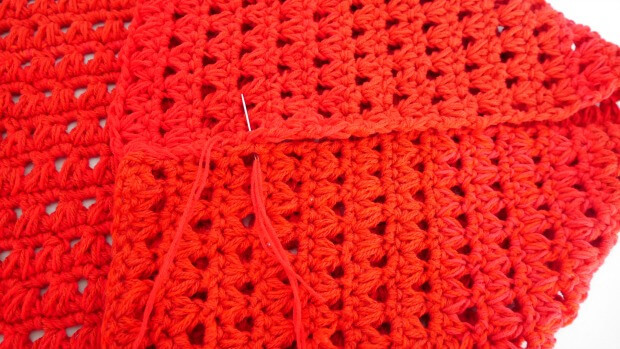 Round2: Start to make triangle stitch in each stitch across until end of the row. turn Video tutorial below. Round3. make 2Sc in each chain space across until end of the row. Repeat row 2 and 3 until your rectangle measures approximately 32 inch wide and 38 inches long then finished off and leave long tail for sewing. Video tutorial for this cocoon cardigan. Lay the piece of rectangle in flatted and fold in the corners then seam and leaving holes for the arm. For the arm holes I leave my one about 8 inch or your prefer length. round1. sc all around the arm hole. Round2. Blo, sc all around the arm hole. Round3. Repeat round2 until your trim measure around 2 inches deep. repeat the same on the other side of the armhole. For the opening of the cardigan. round1. sc all around the opening of the cardigan. Round2. Blo, sc all around the opening. Round3. Repeat round2 until your trim measure around 2 inches deep. Fasten off and weave in end. 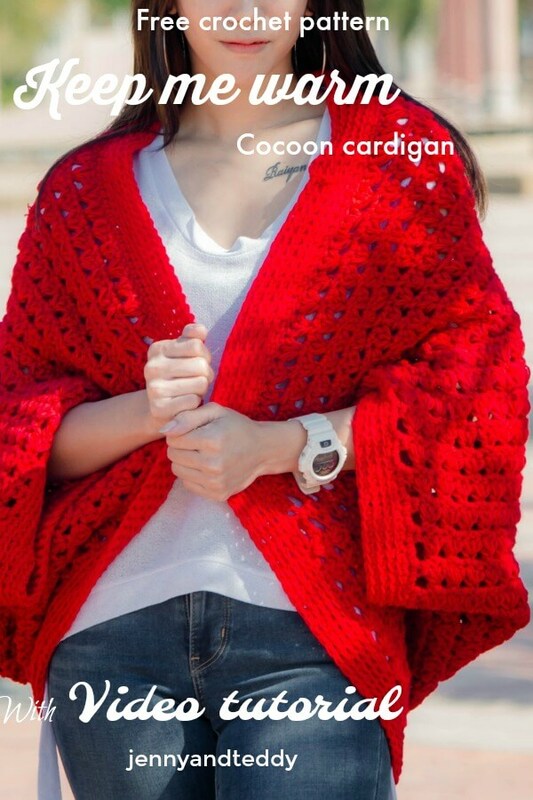 Now Your have your beautiful and cozy cocoon cardigan. I’m thinking you repeated the instructions for the armhole trim twice and didn’t cover around the sleeves or neck and down the front area. Am I wrong? Hi Sandy, Oh yes you are right ^^thanks for tell me, It’s typing mistake, I fixed it now. Tnank you Jane for the new pattern. How many skeins of yarn would you recommend for this project? Hi Keely, I use around 8 skein for hold double but if use use chunky yarn probably 5-6 skein. This was really easy and helpful. Thanks heaps. Hi Zulma, I fold it inward on each end of the rectangle. Thanks for the pattern. Could you tell what the stitch multiple is to make it bigger?